Shinedown bass slinger Eric Bass is getting his own signature bass guitar. The longtime Shinedown bass player has joined forces with Prestige Guitars Ltd. to launch the Prestige Eric Bass Signature Bass. The Prestige Eric Bass Signature Bass will debut at the 2019 NAMM trade show, which is set for Jan. 24 to 27 in Anaheim, California. The official unveiling will take place on Thursday, Jan. 24, from 11 a.m. to 11:30 a.m. at Prestige Booth 3321, and Bass will appear for a signing on Saturday, Jan. 26, from 1 p.m. to 2 p.m. at the same location. After the official launch of the bass, it will be available to order at PrestigeGuitars.com. 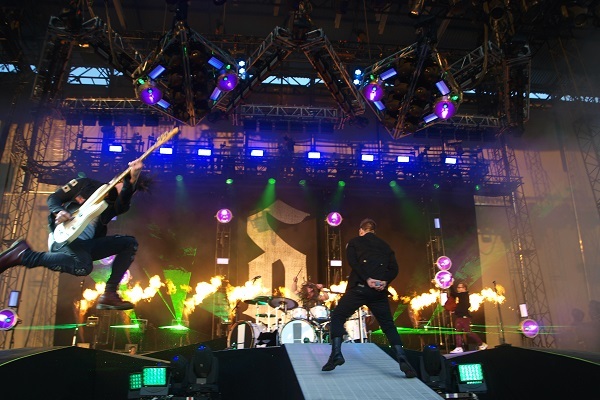 In other news, Shinedown will be back on tour to kick off their 2019 North American run starting Feb. 20 in Estero, Florida. The band will also perform live on “Live with Kelly and Ryan” on Jan. 23.